Cancel Payoneer Account. 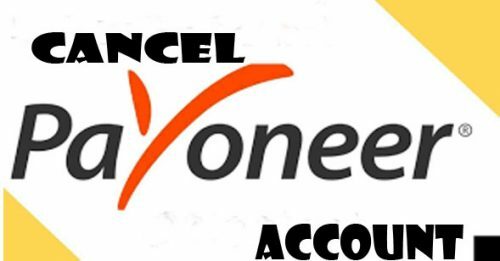 Do you want to cancel Payoneer account? Canceling a Payoneer account may seem to be a wise decision when you wise to no longer user Payoneer again. But there should be some certain reasons why you do not want to use Payoneer again. I would kindly advise you to report any issue to the Payoneer customer service, instead of canceling your account. You should know that Payoneer account coke with certain referral benefits, therefore if you want to keep this in the future you should not cancel your account. Canceling your Payoneer account is very easy, but we should take a look at what happens when you decide to close your Payoneer account. Cancel Payoneer Account – What Happens When You Close Your Payoneer Account? There are quite a series of things that happens when you decide to close such a precious account and there are things you must do before your account would be fully closed. These are a list of things that would happen when you close your payoneer account. You can no longer receive funds from the people you receive from before. Your account would be completely deleted from the payoneer database. Your US account would be closed if you have any. You would be unable to use your payoneer debit card or prepaid card if you have any. You would no longer receive your referral benefits. These are quite some burdens, so I would suggest you don’t close it. If you want to delete your payoneer account because you want to remove a payee ID, then there is another solution to that. Trust me this solution is much better than losing your payoneer account for free. Cancel Payoneer Account – How to Remove a Payee ID from Your Payoneer Account. As this is a US service, this cannot be done by just fill up some forms. To do this there are certain steps you must take. For you to be successful in this step, you need to provide payoneer a valid reason for this and also state the name of the payoneer mass payout company along with the payee ID. If you are fully set for this then follow this link (https://payoneer.custhelp.com/app/login_form/redirect/Contact_us). If after reading this article, and on getting to this point you still decide to cancel your account, then you can proceed further. To continue, you must have a valid reason for wanting to cancel your payoneer account. And you must also exhaust all funds on this account. If you have, follow this link (https://payoneer.custhelp.com/app/login_form/redirect/Contact_us) and follow the procedures you would meet.